Following the first of several community meetings for public art in North Square, the designated artists, A+J Art+Design Team have prepared the following information to communicate their early thinking on the project. North Square is a small square with a big place in history and a big view of the Boston skyline. We propose four sculptures that embrace this idea in four different ways. Our concept resists the idea that there is one history to the Square. 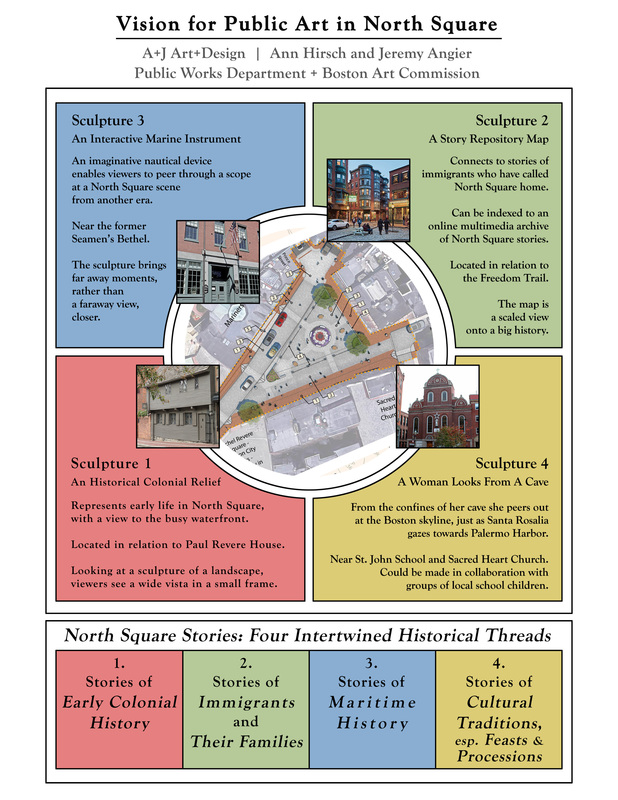 Rather, it emphasizes the many histories and peoples that have made North Square their home over the centuries. We propose four sculptures in bronze, finished with a patina that evokes nautical themes. The size of the sculptures will be human scale. They will be mounted on stone bases, and placed in relation to key architectural features around the Square. Each sculpture echoes the character of the Square as a small space looking outwards to a big view. Some of the sculptures will be made in direct collaboration with the community. The locations of the sculptures in the Square is under consideration, and designs will follow. The overall program of sculptures in situ will seek to increase green space and places to sit and relax around the perimeter of the Square. We hope you will attend the May 11th meeting of the North End Waterfront Residents Association (7pm, Nazzaro Center) where new concept images will be presented. You can also reach out to A+J directly at info@aandjartanddesign.com; to Karin Goodfellow, Director of the Boston Art Commission and North Square Public Art project lead, at karin.goodfellow@boston.gov; and to Maria Lanza, North End Office of Neighborhood Services representative, who is setting up an Advisory Council for the North Square Public Art project, at maria.lanza@boston.gov. For portfolio images and previous project descriptions by A+J Art+Design Team, see www.aandjartanddesign.com.